Fuller House on Netflix, reviewed. Netflix’s sitcom is a pitch-perfect reboot of the original. But who is this show for? Fuller House picks up 20 years after Full House ended, with the entire cast, except the Olsens, present and accounted for. Fuller House, Netflix’s reboot of the late ’80s, early ’90s hit family sitcom Full House, is like the scrunchie, the puckered hair tie dominant in the same era: a nostalgia item out of fashion but trying to get back in, with utility but no aesthetic merits. A scrunchie might look like a sphincter, but it will hold your hair back. Fuller House is a dopey sitcom, but you can watch it with your entire family without offending anything but your intelligence. 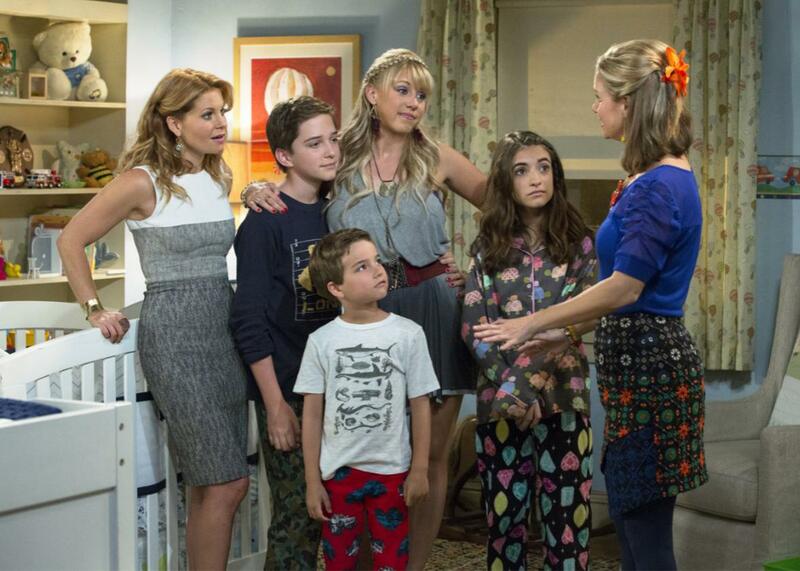 Fuller House scrambles the normal critical circuitry. It is bad, but in a manner so in keeping with the original that to harp on its badness feels like meanness, akin to insulting a three-legged dog for not having four. At the height of its popularity, Full House was a hackneyed and saccharine family sitcom about three men raising three girls. Its contribution to the culture includes a series of catchphrases (“How rude,” “Cut It out,” “You got it dude”), the Olsen twins (who do not appear on Fuller House), and the Full House moment—an episode hallmark in which tensions are resolved with a heartwarming chat scored to soaring elevator music. Full House was a hit, a top 10 show anchoring ABC’s TGIF lineup, and beloved by millions, including me, who as tweenager was a devoted member of its target audience. Fuller House is so in keeping with the spirit of the original, so unabashedly cheesy and canned, so well-meaning and gentle, that though it is bad and has no reason to exist, on its own terms it is also surprisingly good. Fuller House picks up 20 years after Full House ended, with the entire cast, except the Olsens, present and accounted for. In the first episode, the show’s older stars (Bob Saget as Danny, Dave Coulier as Uncle Joey, John Stamos as Uncle Jesse, and Lori Loughlin as Aunt Becky) and the younger stars (Candace Cameron Bure as D.J. Fuller née Tanner, Jodie Sweetin as her younger sister Stephanie, and Andrea Barber as D.J.’s weird best friend Kimmy Gibbler) descend on Danny’s house to wish it goodbye. He’s moving to L.A. and planning to sell (there is an up-to-date reference about the fortune one of the painted ladies could fetch on the San Francisco real estate market), forcing the recently widowed D.J. and her three sons, who have been living with Danny, to find their own apartment. One classic Full House moment later, Danny decides to keep the house for D.J. and her kids. Stephanie, now a club DJ (yes, she performs under the name DJ Tanner), and divorcée Kimmy and her daughter move in to help. The older actors make cameos, but the series focuses on the three women, instead of three men, raising three boys and a girl. The first episode contains more fan service than The Force Awakens. The premiere boasts all the old catchphrases, a dance number to New Kids on the Block, and a cute infant played by twins. It has a devotion to continuity that verges on overkill, and in the case of casting the two actors who played Jesse and Becky’s toddler twins, surpasses it: They have become awkward, non-actorly-seeming adults. The episodes, which all wrap up neatly and sweetly, feature storylines about D.J.’s eldest son Jackson (Michael Campion) disobeying her but not in a deeply rebellious way, the three women going out for a night on the town which climaxes, natch, in a Dirty Dancing homage, and an episode—almost really moving!—in which Stephanie realizes how much her nephews have come to mean to her. Changes include running times significantly longer than 22 minutes, slightly less corny lesson learning, and a marginally bawdier sense of humor, as when D.J. mistakes an online date for a plumber and tells him “I need a man to work on my pipes.” There has also been a small increase in diversity. Kimmy’s ex-husband is a Latino (fiery, you’ll be surprised to hear), and their daughter Ramona (Soni Bringas) remarks that the Tanners are “the whitest family in America, like an albino drinking milk.” It’s a flash of self-awareness that’s undercut by a future scene in which Kimmy and Stephanie cringingly use the word “fleek.” (To be fair, I would have guessed Fuller House would be stuck on “twerk.”) The aspects of the show that are meant to be up to date feel decidedly out of it. Stephanie goes to play Coachella and it looks like a hotel lobby. Macy Gray guest stars. The show may star women, but it is one dad joke after another. It is wholly in keeping with the spirit of Full House. Fuller House suffers a little from a lack of Stamos. Cameron Bure likably and capably slides into the Danny role as the show’s only responsible adult. Barber’s “quirky” Kimmy Gibbler—who will break your heart once you recognize her kinship with The Comeback’s Aunt Sassy—is even more irksome than Uncle Joey, but significantly less irksome than his woodchuck puppet (who also returns). That leaves Sweetin’s Stephanie to take over for Uncle Jesse as the cool one. Despite giving Stephanie the theoretically appropriate accessories—Coachella, references to hanging with Rihanna, a thriving career as a DJ— it doesn’t work. There, if nowhere else, is a discontinuity: goodie-two shoes Stephanie Tanner, once obsessively fixated on bad manners—“how rude!”—does not grow up to be a party girl. Fuller House is not so dissimilar from shows that you might currently find on the Disney Channel or Nickelodeon, but because its progenitor aired on ABC two decades ago, when the major networks were still making unsophisticated family comedies aimed more at kids than at their parents, it has name recognition among adults that those Disney and Nickelodeon shows lack. With Fuller House, Netflix pads its library with a show for tweens that parents are familiar with and even possibly willing to watch. A brand new sitcom created in the milquetoast and geriatric spirit of Full House could deepen Netflix’s tween offerings, but it could never get the attention of Fuller House. Netflix is currently operating with a seemingly unlimited budget and swaggering reputation, game to please small segments of its audience in the splashiest way possible. Add all that up and Fuller House is what you got, dude.